Whether you are looking to upgrade your existing windows, replace your doors or upgrade your roofline; Prestige for your Home covers Northamptonshire, Bedfordshire and Buckinghamshire and can help you decide which style of windows,doors and roofline will suite your property best. Prestige for your Home offers a wide range of windows in style to suite your home. We can match the style of your new windows to your existing ones or supply you with something completely unique. We will advise you and talk you through every option and tailor your windows to your exact needs. All our windows are A rated as standard, which means replacing your old windows with Prestige for Your Home could save you up to 20% on energy bills. In addition all our windows are equipped in multi-point high-security locking mechanisms, making them very secure and providing you with a peace of mind. Creating the perfect colour scheme for your home doesn‘t have to stop at the interior decoration. All the windows from provided by us range are available in a wide range of coloured profiles which will allow you to choose a perfect window to enhance the design of your home. Prestige for your Home offers a wide variety of styles, sizes, colours and finishes of doors to suit all properties and budgets. All made to made to measure in a colour of your choice, perfectly designed to ensure warmth and security. All of our doors come with the latest high security frame for your piece of mind. Triple sealed and insulated for better energy efficiency. Guaranteed against discolouration, warping and cracking. The latest technology to prevent forced entry. Internal webbing and thick walls to withstand knocks. Energy efficiency; All doors are ‘B’ rated as standard, with ‘A’ rated optional. When your roofline begins to look untidy and old it can have a detrimental effect on the entire appearance of your home. Prestige for Your Home can replace your old roofline with a new one and update the design of your home in no time. Maintaining existing wooden roofline can be costly and time consuming. By replacing the old wooden products with quality, weather resistant, long lasting UPVC, you never need to think about the painting or maintenance problems again. 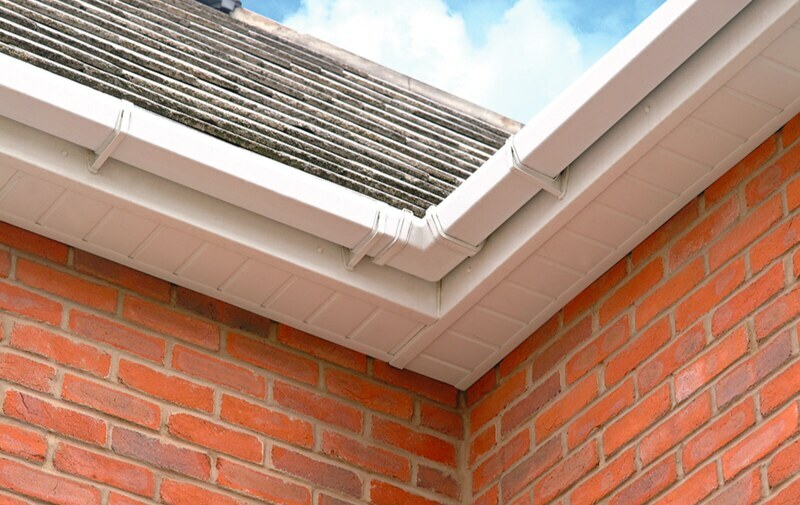 Prestige for your Home can install new UPVC Fascia, Soffit and Guttering throughout Northampton, Milton Keynes, Bedford and surrounding areas. Where existing timber fascias are in good condition, capping board is a cost-effective way to freshen up your roofline and protect it against the elements. Prestige for your Home 9mm-thick UPVC capping board is available in a variety of colours to perfectly match your existing doors and windows. If the existing timber roofline is completely perished and a capping board is not feasible, we would always recommend a total replacement. In this instance, all the timber is stripped off and we would install 18mm thick fascia board.